Rise and shine! It's breakfast time! Today is the 1st day of September, as well as the first day of Vegan MoFo, when plant-based food lovers all over the world are going to be flooding the Internet with their favorite foods, stories, restaurants, recipes, etc. The goal is to write an entry a day, and this year they're doing something different--giving prompts for each day of the month! Today it's all about breakfast. I've been super excited about Vegan Mofo for a while now (it's my first year participating which I am thrilled about! ), and I wanted to start off strong for you all. I do have to go to work, however, so I've put together a little something in advance. Most week days, my breakfast consists of cereal with almond milk (today I'll be having some peanut butter panda puffs), tea and some fruit or juice (and an occasional smoothie). On the weekends, though, the fun happens! 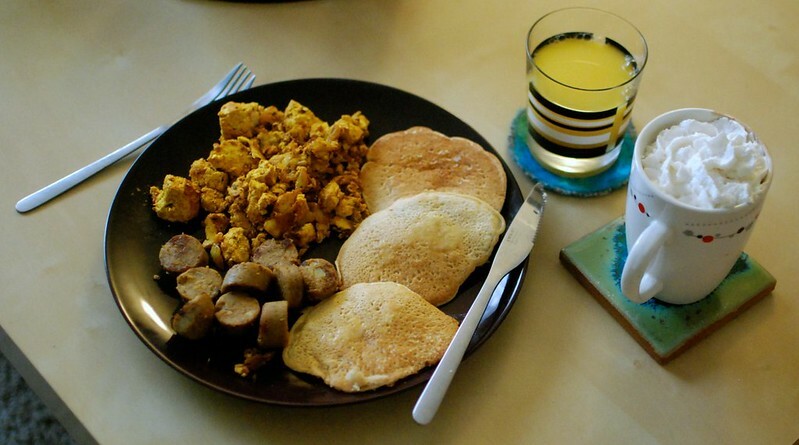 So I'm going to talk about some of my favorite weekend breakfast foods with you all--the good stuff. Vegan pancakes were one of the first things I mastered. Vegan with a Vengeance has an amazing recipe for chocolate pancakes with chocolate chips that is my absolute favorite pancake of all time. My husband (for some crazy reason), is not quite so into the chocolate on chocolate for breakfast, so we often tend towards the "plain" pancake (which I will admit, is basically just as good as the chocolate version). Again, my classic go-to recipe for pancakes for years was from Vegan with a Vengeance which is delicious (see photo below). 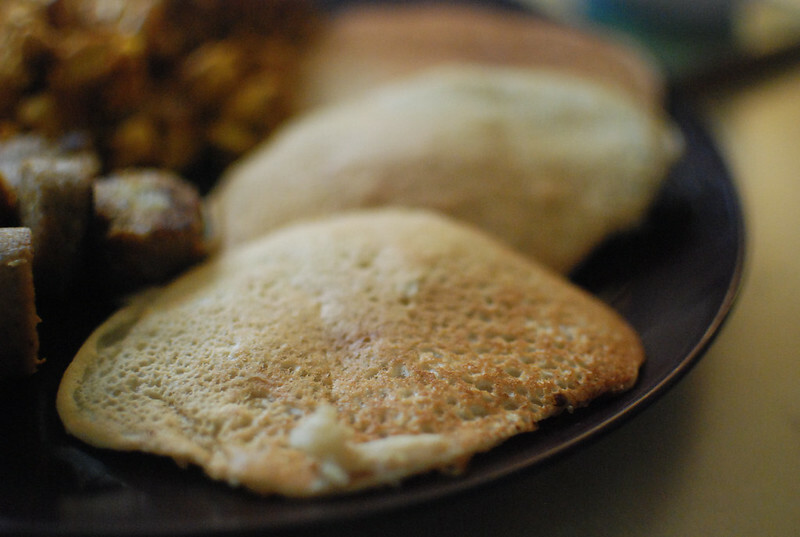 I've recently, however, moved on to the pillowy pancakes on PPK (and also in Isa Does It!). 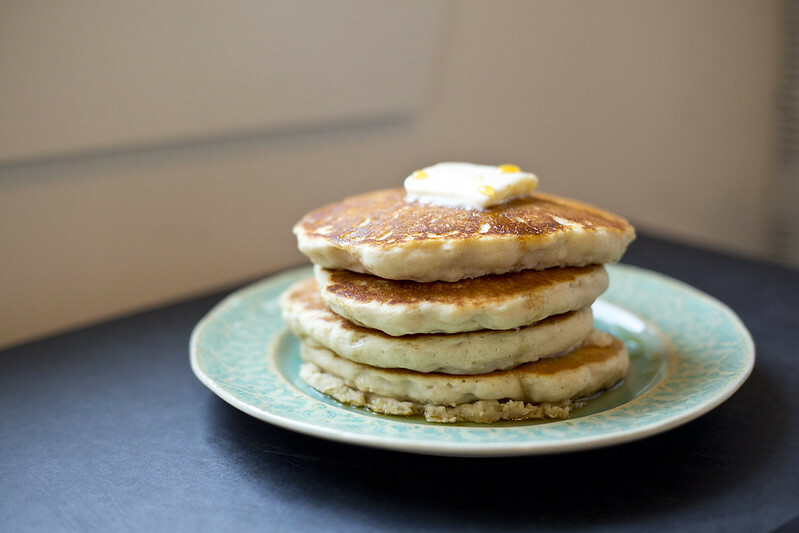 These pancakes bring to mind the thick, fluffy pancakes, you might get at some fancy brunch spot. 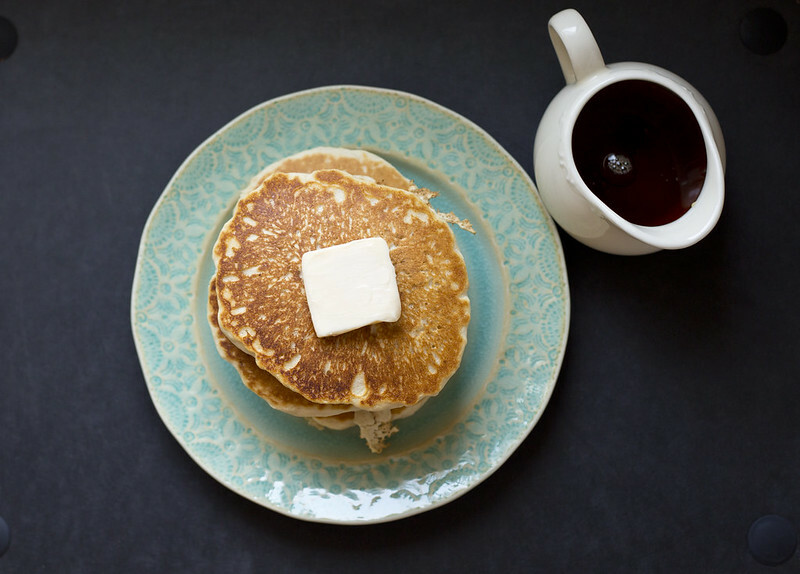 What should you pair with these amazingly delicious pancakes you ask? The world is your oyster! For starters, butter and maple syrup (duh). I love Earth Balance buttery spread or buttery sticks. As for the other accompaniments, I highly recommend some type of protein. 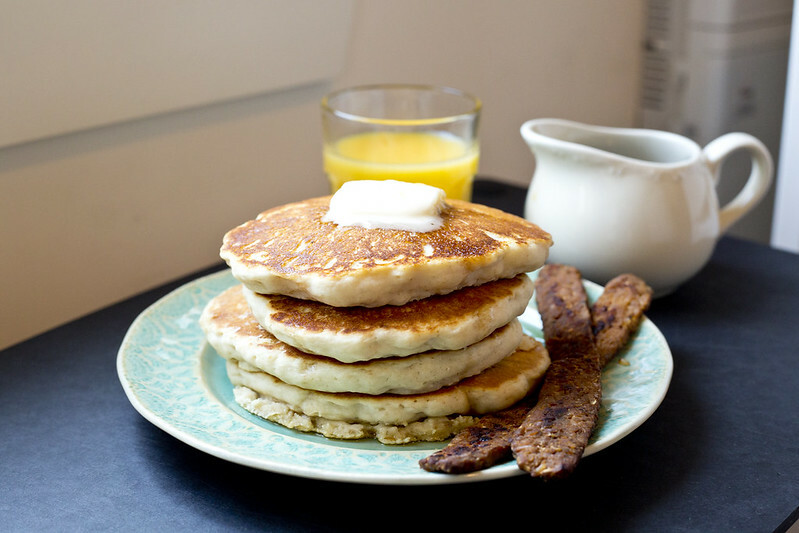 Tempeh bacon or veggie sausage is always a great, super-easy choice. For the bacon, I love Fakin' Bacon, though it's also super easy to make your own tempeh bacon. For sausages, Field Roast is my absolute favorite (the smoked apple sage for breakfast is especially excellent). You just pan fry in a little oil until golden or crispy (whatever your preference), and you're good to go! Like a little scramble with your pancake? Me too!! 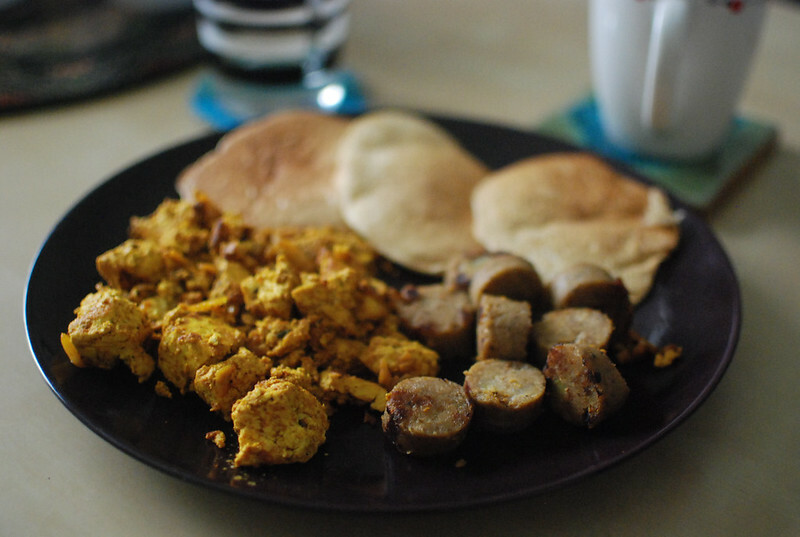 Again, I have to point to Vegan with a Vengeance for introducing me to my all-time favorite tofu scramble (the recipe is also available on PPK). This is not your typical tofu scramble. It's packed with flavors and veggies, and can be made in all kinds of different variations. It puts every tofu scramble I've ever had in a restaurant to shame.